For 32 years I was the Member of Parliament for Banbury. Banbury is a market town which serves a large catchment area straddling three counties. The Horton General Hospital serves a similar catchment area of some 150,000 people spread across three counties. Over the years, the Horton Hospital has faced a number of threats of downgrading. Whilst I was Member of Parliament in 2008, there were proposals to downgrade paediatric services, obstetrics and gynaecology. These proposals were referred to the Independent Reconfiguration Panel (IRP). The IRP made six recommendations. Recommendation 4 was that “the PCT must develop a clear vision for children’s and maternity services within an explicit strategy for services for North Oxfordshire as a whole”. And Recommendation 5 was “the ORH must do more to develop clinically integrated practice across the Horton, John Radcliffe and Churchill sites as well as developing the wider clinical networks with other hospitals, primary care and the independent sector”. The IRP gave the Oxford Radcliffe Hospitals NHS Trust a month within the publication of the Report to publish a plan including a timeline for taking forward the work proposed by their Recommendations. In fairness, the Oxford Radcliffe Hospitals NHS Trust undertook that work which resulted in there being consultant-delivered children’s services at the Horton General Hospital and a consultant-led maternity service. It is disappointing that within so few years of such clear recommendations from the Independent Reconfiguration Panel that the identical services are again being threatened at the Horton. It is very difficult for people to understand the Clinical Commissioning Group’s exact proposals because the CCG has chosen to split the consultation process. By splitting the consultation process, the Trust’s proposal and the consultation has become confused. It is impossible to understand the full implications of the proposals in Phase One, without knowing what will be put forward in Phase Two. In 2008, GPs and other health providers in Northamptonshire and Warwickshire were very much involved in opposing the Trust’s then plans to downgrade services at the Horton. There is little evidence that the Trust has sought this time to consult GPs in Warwickshire and Northamptonshire and it is not surprising that some medical services will be considered to be less sustainable if the Trust is ignoring a sizeable part of the Horton Hospital’s catchment area. It is disappointing that the consultation paper only presents the Trust’s own preferred option. It gives every characteristic of the Trust seeking to present a “fait accompli”. It is worth recalling that this is exactly what the Trust with the proposals they put forward last time in 2007/2008, proposals which were described unanimously by local GPs as being “unsafe and unsustainable”. It seems bizarre that the Oxford University Hospitals NHS Trust wishes to reduce beds and downgrade services at the Horton General Hospital at exactly the time that Banbury and Bicester are growing rapidly with large numbers of new houses visibly being built and Cherwell District Council’s Local Plan stating that 23,000 further houses will be built in the district between now and 2031. The IRP concluded in 2008 that the John Radcliffe Hospital is too far and too inaccessible for many of those living in North Oxfordshire. Nothing has happened in the intervening years to make the John Radcliffe any nearer and less inaccessible. The Trust, as always, has failed to have proper regard to the inevitable domino effect of their proposals so removing obstetric services will have a knock-on effect on the anaesthetics rota and that will inevitably undermine capacity to provide any acute services provided at the Horton General Hospital. There has been considerable confusion about the contingency arrangements to be put in place should the Horton Maternity Unit be downgraded to a Midwife-led Unit (MLU). The pre-business consultation case talked about a static ambulance situation at the Horton General Hospital. However, at a public meeting in St. Mary’s Church at which I was present, it was suggested that this ambulance be removed should the service become a Midwife-led Unit. I understand that at other meetings those attending were told that the ambulance would remain. How are people expected to comment on proposals without having any clarity on how transfers will take place should the suspension of consultant-led maternity at the Horton become permanent. I understand that in the short time there has been an MLU at the Horton it has been necessary for the static ambulance to be used over forty times. These are not one offs. These are regular occurrences. It is very unfair on expectant mothers for them to have to contemplate being moved in labour some distance over some time to the John Radcliffe. When I was involved, as Member of Parliament, in the 2007/8 discussions, the Horton General Hospital was seeing approximately 1,500 births per year. I understand that since the suspension of consultant-led maternity at the end of January, there have been just 61 babies born at the Horton – equivalent of just some 190 births a year where mothers elect to use a local MLU. The consequence will be that there will be some 1,300 plus births that will have to take place elsewhere. Is the John Radcliffe able to cope with this extra demand? And inevitably the larger the Unit, the more difficult it must become to provide mothers with personalised care. In the last Report, the IRP observed that “We were disappointed in the limited extent of clinical and systems integration between the John Radcliffe, Churchill and Horton Hospitals and consider that more should have been achieved given the time the hospitals have been within the same Trust. This is relevant to this Review because there is the greater potential to support local services at the Horton Hospital than there would be if the Horton was linked with another smaller district General Hospital . 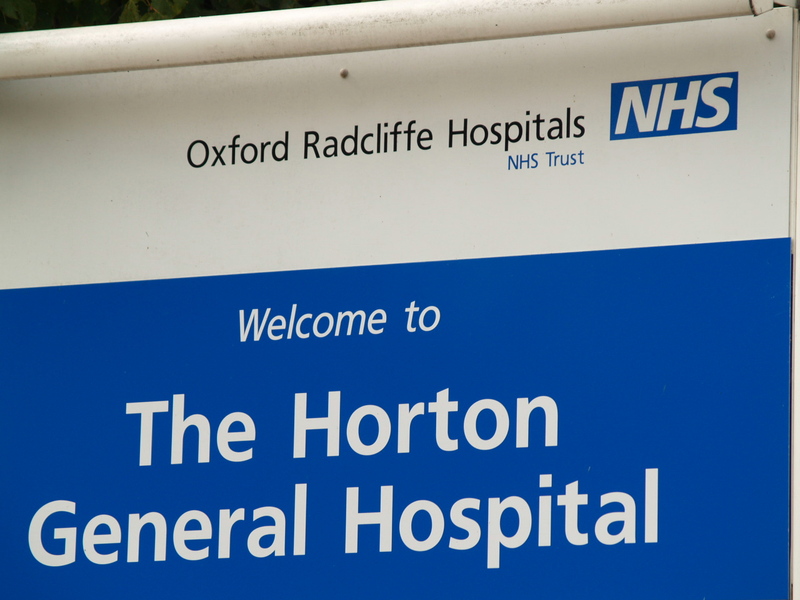 . . the Oxford Radcliffe Hospitals NHS Trust’s commitment that the Horton Hospital is an important part of its portfolio needs clear reinforcement in its future strategic documents. The IRP was left with a sense that the Horton Hospital remains a problem to be solved rather than a development opportunity”. Sadly, nothing seems to have changed in the intervening years and one is still left with the very strong impression that so far as the Oxford University Hospitals NHS Trust is concerned, “the Horton Hospital remains a problem to be solved rather than a development opportunity”. Local people and local communities are faced with almost identical proposals from the Oxford University Hospitals NHS Trust as we were in 2007. The IRP’s conclusions on those proposals could not have been clearer and I would suggest that nothing has happened in the intervening years either to negate the IRP’s conclusions or to justify the Oxford University Hospitals NHS Trust seeking yet again to downgrade services at the Horton General Hospital. The effect of the Trust’s proposals will mean that the Horton will no longer be a hospital in any recognisable sense of that word, but will simply be a random collection of outpatient clinics and medical services, risking further deterioration as the undermining of anaesthetics puts further acute services at risk. It is also clear that the Oxford University Hospitals NHS Trust no longer wish the Horton Hospital to be serving the people of the Banbury catchment area, but rather that anyone living in Northamptonshire, notwithstanding they may only live a couple of miles away from Banbury are increasingly going to be pressurised to use services in Northamptonshire and people living in Warwickshire, again notwithstanding they may only live a few miles away from Banbury, are increasingly going to be pressurised to use NHS services in Warwickshire – this does not seem to reflect any attempt at an integrated NHS provision for patients. To download a copy of the full letter, please click on the following link: 170407 STB HGH CCG Submission.